Many of our nonprofit clients benefit from the Salesforce Foundation’s Nonprofit Starter Pack (NPSP). The NPSP comes with donor history data (Last Gift Amount/Date, Total Gifts This Year, Last Year and Two Years Ago, Total Household Gifts). Predictive clients can use this to segment email lists during a year end campaign or inject dynamic content into their blast newsletters. A simple sentence in an email which indicates that you know your recipient already gave this year, or hasn’t given in over 2 years, can go a long way to increasing your digital engagement. Below is a formula we often use with the NPSP 3.0+ to provide an easy high level view of the recency of your supporters. 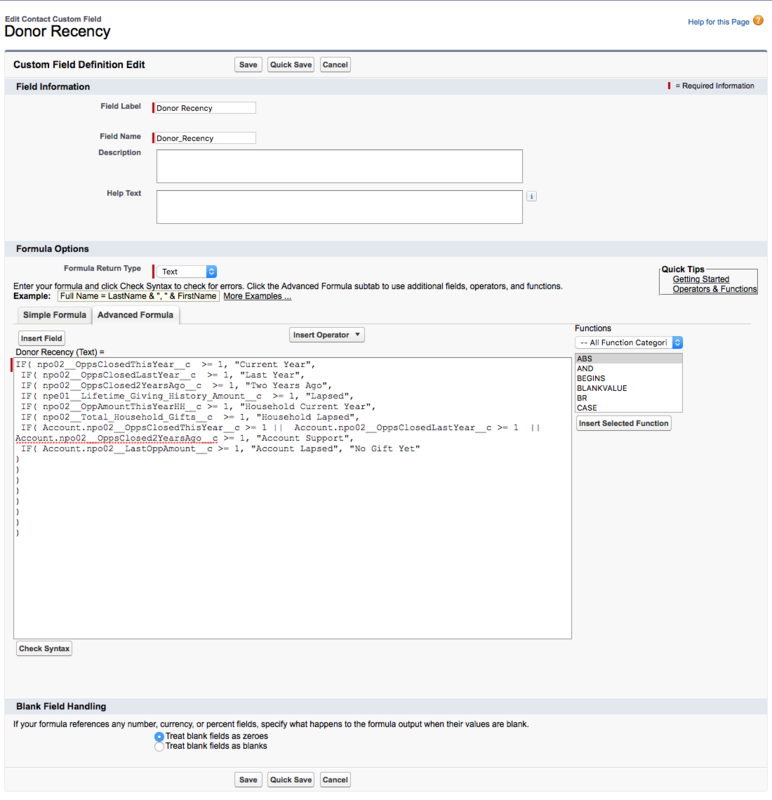 Please feel free to copy and paste it into your Salesforce instance as a new contact formula field we call Donor Recency. IF( Account.npo02__LastOppAmount__c >= 1, "Account Lapsed", "No Gift Yet"
Now, each of your contacts will be clearly identified by the date of their most recent gift (could be an individual, household or account gift). Salesforce reports can summarize how many contacts are in which segment and Predictive’s marketing automation with dynamic content can provide customized messages based on this segmentation. To learn more about Predictive’s NPSP integration, book a demo today. Click on the image above to see what the Salesforce.com formula page looks like. New to the platform? You can review Salesforce.com’s documentation on how to create formula fields.